One of the biggest selling points of the Asus ZenFone 2, aside from the low price-point, is the fact that is one of the first devices to come with 4 GB of RAM. Powering the 4 GB of RAM is a quad-core Intel Atom Z3580 processor which is clocked at 2.3 GHz. While the device does have 4 GB of RAM, it is LPDDR3, not the latest LPDDR4 which is found in many flagships of 2015. 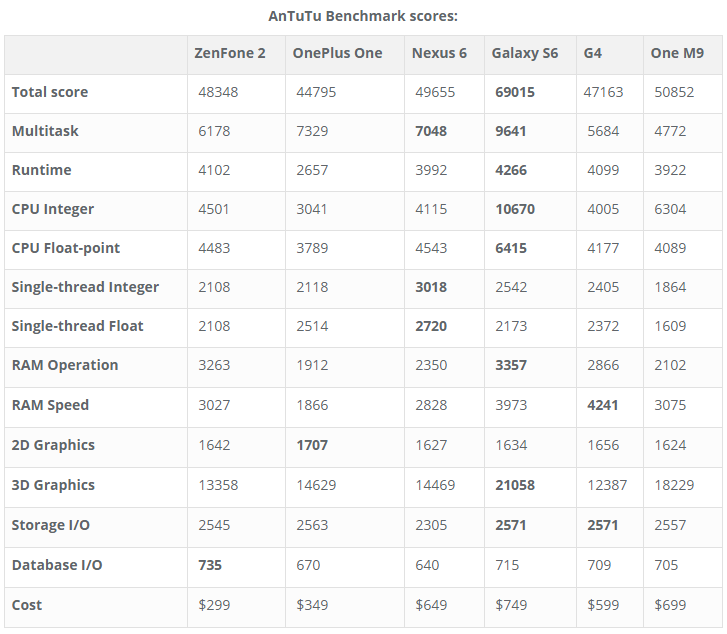 So how does the ZenFone 2 with an Intel processor stack up against other flagships on the AnTuTu Benchmark? I threw together a nice table to give you a perspective. The highest ranked phone in each category will be bold. If you are on a mobile device and cannot see the entire table, please click here. If you would like to view this in a sortable list, please click here. As you can see, the Galaxy S6 still reigns supreme in virtually every category, but the Asus ZenFone 2 definitely can hold its own against the top flagships. Not only that, but it has the cheapest price tag of any of the aforementioned devices. I would personally like to see what the device can do rooted and maybe even running a custom ROM. There is plenty of potential under the hood of the Asus ZenFone 2, and it will only continue to get better through updates. Not only that, but the device is currently running the very first version of Android Lollipop, which is behind the other devices, most of which are on 5.0.2, aside from the Nexus 6 (5.1.1) and the LG G4 (5.1). I’ve already received two updates since owning the device, so I’m hopeful for a major one in the near future. Stay tuned for the full review of the ZenFone 2, as I’ll be going over the entire device, not just the hardware. If you have any specific questions about the device, be sure to drop a comment below; I’d definitely appreciate it!